In the News: Tune, Entrekin & White P.C.’s attorney, Peter Strianse is at the center of the Casey Moreland case that is currently capturing the attention of the nation. 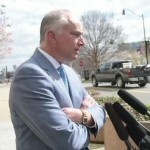 Tune, Entrekin & White’s Peter Strianse, is Casey Moreland’s attorney. He spoke with the press on Tuesday regarding Casey Moreland’s arrest. Mr. Strianse is regularly involved in high-profile cases. He frequently represents elected officials, professional athletes, lawyers and other clients who have been charged with serious criminal offenses that draw considerable attention from the media. In addition to his proficiency in dealing with the media, Mr. Strianse has a thorough understanding of how to best assist his clients through the process of legal investigations, litigation, and crisis management. Mr. Strianse’s practice focuses on federal and state criminal defense. He utilizes his extensive litigation experience and to achieve the best possible results possible for each of his clients. His tough but principled approach, coupled with considerable experience, has allowed him to obtain consistent results in and out of the courtroom. To read more about the Casey Moreland case, see today’s article in The New York Times.